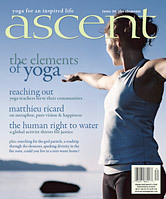 ascent goes on a low-carbon diet! When our friend Vanessa Reid approached us with the idea of writing about the zero waste experiment she was doing in her home for our Elements issue (waste not, want not, issue #36), we got to thinking about the choices we’re making in our office and our own homes. While we’re pretty conscious about consumption here (everyone walks or bikes to work, and we reuse all of our office paper), we could certainly be doing more to treat our resources and our environment with respect. Soon after, we came across a book that had been sent to us from David Gershon at The Empowerment Institute (see our web exclusive interview with Gershon, empowering change). The book is called Low Carbon Diet: A 30-Day Program to Lose 5000 Pounds. It outlines an easy-to-follow system for going on a group “diet” aimed at decreasing consumption and waste through lowering our carbon footprint. There’s lots of room to make individual choices in the diet, and the group structure helps hold us to our commitments. Each one of us at ascent has chosen a number of actions we’re going to take on a daily basis, and we’ll be blogging about our experiment each week. For example, some of us are focusing on creative ways of limiting our water use, others have committed to reducing food and packaging waste or using less heat and electricity. Whatever our choices, we’ve committed to reducing our individual environmental footprint by at least 25%. We’re excited to see where this will go and hope you’ll join us on the journey! For more information about the Low Carbon Diet, to order the book or start an eco-team in your own community, please go to: www.empowermentinstitute.net/lcd.